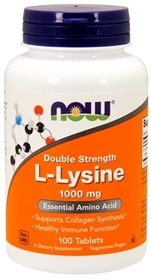 L-Lysine is an essential amino acid, which means your body cannot manufacture it. It must be obtained through the diet or by supplementation. Lysine is one of the most well known amino acids and is an essential component of all proteins. Although more than 300 different amino acids exist in nature, only 20 serve as building blocks for proteins, and lysine is one of them. Most of these amino acids occur as stereoisomers, which means there are two forms of each, known as the D form and the L form, that are mirror images of each other. Only the L form of amino acids becomes incorporated into protein and gets used by your body. In addition to contributing to protein structure, some L-amino acids, such as lysine, will benefit your health when taken as a dietary supplement. The herpes simplex virus is responsible for the occurrence of both oral herpes, or cold sores, and genital herpes. Lysine may hold the virus in check and decrease the number of cold sores or genital herpes outbreaks you experience, and it may also make the sores heal more quickly. Supplementing with 1 to 3 grams of lysine each day may limit recurrences, while taking this amino acid as soon as outbreak symptoms begin may reduce the length of time your herpes sores last. Because your body can’t manufacture lysine, you must include it in the foods you eat. In populations in which wheat is the predominant food staple, lysine deficiency can occur, as only low levels of this amino acid are available in the grain. Low dietary lysine might not only lead to overall protein deficiency symptoms, such as a compromised immune system and failure to grow, but also to heightened levels of stress and anxiety. In the April 2004 issue of the “Proceedings of the National Academy of Sciences,” researchers report that supplementing cereal-based diets with lysine reduced chronic anxiety and stress in a low-income population that consumed wheat as a primary diet component. Lysine supplementation therefore will improve your mental well-being if this amino acid is lacking in your diet. Promotes normal growth & development by increasing collagen formation. Supports the production of other proteins like enzymes, antibodies and hormones. Promotes bone health by increasing calcium absorption; prevents osteoporosis or weak bones by reducing bone loss. Helps convert fatty acids to energy, aiding in weight reduction. Can lower bad cholesterol levels, thus reducing the risk for heart disease. Promotes skin health through increased collagen formation. May be used to treat viral infections like herpes simplex, cold sores, shingles, human papilloma virus (HPV) infection such as genital warts, and genital herpes. Can relieve migraines and other types of pain and inflammation. Taken with other nutrients like vitamin C, it can reduce chest pains related to heart disease. Contributes to muscle building, when taken with other amino acids like arginine. Suggested Usage: As a dietary supplement, take 1 capsule 1 to 3 times daily, with or between meals. Consider taking this product in combination with NOW® L-Proline, Zinc and AlliBiotic CF™.